“The matter to which Christian theology is commanded to attend, and by which it is directed in all its operations, is the presence of the perfect God as it is announced in the gospel” (p. 1). John Webster’s latest collection of essays in dogmatics opens with this programmatic statement. Some of Webster’s central commitments are clearly expressed in this opening statement: in particular, the ideas of God’s presence and of God’s perfection. 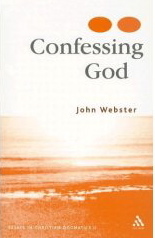 For Webster, God’s perfection is “the sovereign and majestic fullness with which God is himself” (p. 1). To speak of God’s perfection is thus “to indicate this one in the supreme radiance and completeness of his triune being and act” (p. 88). Following Barth, Webster affirms that God’s perfection includes within itself the movement in which God turns towards his creatures in grace. This means that God’s presence to humanity should not be conceived of as a mediated presence – as though God were essentially remote from his creatures. On the contrary, God is perfect in his movement towards us; he is perfect in his electing prevenience. In Jesus Christ, God is always already “majestically and spontaneously present” (p. 188). Such an emphasis on the unmediated character of God’s presence has far-reaching significance for the way in which Webster articulates various theological themes. For instance, while biblical hermeneutics often posits a fundamental gap between scripture and the contemporary interpreter, Webster argues that there is no such gap: scripture is already “clear” because of God’s own radiant presence to us (chapter 2). Thus on the basis of God’s prevenient presence we need only develop “an untroubled and circumscribed hermeneutics” (p. 46). Or, for another example, in an essay on ecclesiology (chapter 7) Webster emphasises the relationship between Christ and the church as one of “precedence and subsequence, giving and receiving” (p. 170) – it is a relationship established by God’s prevenient presence and action. Thus the church is neither an extension of divine agency nor merely a specific form of social community, but it is a responsive movement towards the presence and actuality of the perfect God. Again, in discussing the method of christology (chapter 6), Webster argues against any a priori inquiry into the conditions for knowledge of Jesus Christ, since such a procedure would undermine christology’s real object: the sheer presence of Jesus Christ in the radiance of his “lordly actuality” (p. 139). These examples further highlight Webster’s consistent strategy of orienting all theological questions around the doctrine of God. We can talk about the clarity of scripture, for instance, only by first understanding the radiant clarity of God’s own self-communicating presence (chapter 2); we can talk about the church only by first understanding the prevenient act and being of the God of the gospel (chapter 7); we can talk about human action only by first understanding the perfect act with which God turns towards his creatures in grace (chapter 8); we can talk about an “ethics of freedom” only by first developing a “dogmatics of freedom” in which God’s own freedom-for-us is articulated (chapter 9). This profound and rigorous concentration on God’s perfection, God’s prevenience, God’s actuality underlies all Webster’s dogmatic work. And it is precisely this concentration that grounds Webster’s methodological approach to dogmatics as a positive ecclesial science. Theology does not seek to generate knowledge of God; rather, it arises from that knowledge of God which is already present in the church (p. 142). The task of theology, then, is not merely to criticise or reinvent Christian belief (p. 83), but to repeat God’s name, to utter that which has already been uttered (p. 114). Theology therefore has a fundamentally descriptive rather than analytic task (p. 93). Further, the distinctiveness of theology as an academic discipline lies not in the fact that it talks about God, but in the fact that it invokes God “as agent in the intellectual practice of theology” (p. 25). This positive science therefore requires a “conversion” and “reordering” of reason (p. 112), a grasping of reason by the gracious perfection of God. Methodologically, too, theology thus remains committed to the prevenient actuality of the God of the gospel. The remarkable essays in this collection show clearly that John Webster is emerging not only as the finest theological thinker working in Britain today, but also as one of the most promising dogmatic theologians anywhere in the world.